Deed Book C, page 449, Logan County Clerk’s Office, Logan, WV. John Fry is my great-great-great-great-grandfather. I descend from three of his children. Deed Book C, page 450, Logan County Clerk’s Office, Logan, WV. This property is located in present-day Lincoln County, WV. Green Shoal Creek is a tributary of the Guyandotte River located in Harts Creek District of Lincoln County, West Virginia. Prior to 1863, the stream was located in Virginia, and prior to 1869, it was located in Logan County. Today, it is situated on Route 10 between the communities of Ferrellsburg and Toney. Prior to the Civil War, Green Shoal was a sort of community hub for the Harts Creek area. Green Shoal had the first post office located in the Harts area. Green Shoal Post Office was established on January 4, 1855. It was discontinued on July 9, 1866. Burbus C. Toney, son of Squire and Nancy (Brown) Toney, was postmaster from 1855 to 1866. Green Shoal Post Office was re-established on November 25, 1873. Admiral S. Fry, a Confederate veteran and merchant, served as postmaster until November 1, 1878. Kale Steele served as postmaster until November 17, 1879. The post office was discontinued on November 17, 1879. Greenshoal Post Office was established on December 20, 1899. James H. McComas served as postmaster until April 5, 1901. According to one period newspaper account, C. Brumfield replaced McComas on April 2, 1901. Official records cite McComas as postmaster until December 22, 1902. George W. Ferrell, adopted son of local merchants, served as postmaster from December 22, 1902 until December 27, 1904. At this latter date, the post office was discontinued to Ferrellsburg. The next day, Brandon, Billy, and I went to investigate the Watson Lucas-Lon Lambert home at the mouth of Green Shoal. For a long time, we had suspected it of being the actual “murder house,” the place where Haley and McCoy had been brutally murdered in 1889. Cecil Lambert, the current owner and occupant of the dwelling, told us, however, upon our arrival that it was not the same house. He said his father, Lon, had told him prior to his death that the old Fry log house was long torn down. The Fry home, he said, had been located just a few feet downriver from the current home, generally at the present-day location of a garage. Cecil had done some recent remodeling and was pretty sure that his father was correct: he hadn’t found a single log anywhere behind the walls. Cecil walked us over to a nearby embankment and showed us what he figured to be the last remaining vestige of the Fry house: some old foundation stones strewn down into a ditch. He then took us through the house, which (unfortunately for our imaginations) really didn’t have a nineteenth century look to it. There was one thing on the second floor that excited us: easily visible through a large hole in the wall (courtesy of Cecil’s remodeling) were some old dried beans lying on the rafter “floor.” It made us think of what Vergia Rooney had said about people using the top story of the old Fry house for drying peaches and apples. Of course, the beans we could see were not George Fry’s…but finding them like we did sure struck us as a coincidence. Back outside, Brandon walked around the house searching for anything that might connect it with the events of 1889. He made a significant find on the upriver side, which Vergia remembered as being part of the original house. Clearly visible in a corner was an old foundation stone just like the ones at the ditch. We did not notice any more old stones under the house that day, but Cecil later found many more after further remodeling. On the upriver (or “original”) side of the house, foundation stones were intact (at least partially) while on the downriver (or “newer”) side, foundation stones had been tossed in the ditch. There was also a “hidden” door on the downriver side of the house (where Vergia had remembered one swinging open in the old days). Back at Billy’s, Brandon got out the Fry history book and located a picture of A.S. Fry’s home at Green Shoal, presumably taken around the time of the murders. We compared it mentally with what we remembered about the present home at Green Shoal and noted a few similarities but nothing really conclusive. 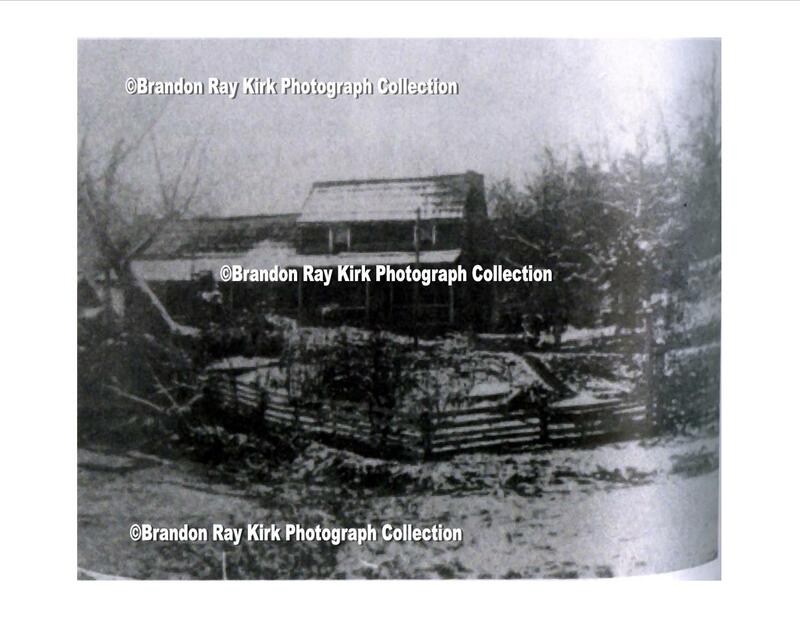 Then we noticed in the photograph that the Fry dwelling had an extension of rough lumber off to one side that resembled the current Lambert house. It wasn’t clear whether the log portion was on the upriver or downriver side but if it was on the downriver side (the end Vergia said was torn away) it would explain why some of the old foundation stones were lying about in that direction. In such a scenario, both Vergia and Lambert would be correct in their account of what happened to the Fry house. In other words, there was a real chance that the building was at least partly intact — although radically remodeled.